A bicyclist cruises using the new Copenhagen Wheel. This design, a project of the MIT SENSEable City Lab and distributed by Superpedestrian, replaces the rear wheel of a bicycle with a battery-powered motor, transforming an ordinary bicycle into a hybrid e-bike. Photo by Max Tomasinelli. Have you ever wished your bicycle could give you a boost while biking uphill or riding long distances? 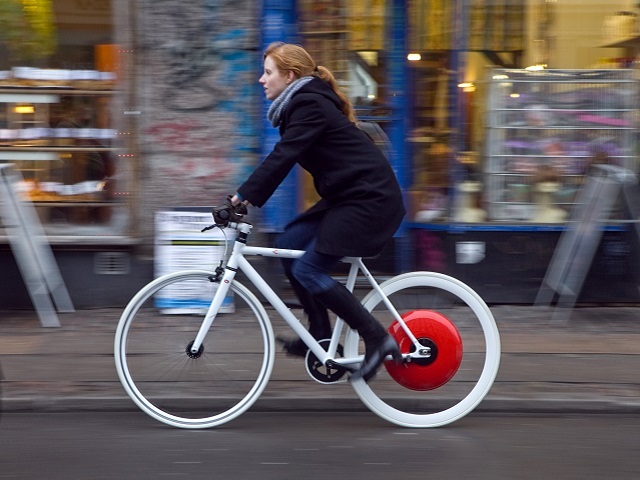 Thanks to the new Copenhagen Wheel from Superpedestrian, a start-up company based in Boston, bikes will be able to do just that by early 2014. By adding a motor to a bicycle’s rear wheel and developing a smartphone app to control it, Superpedestrian is transforming bicycles into hybrid e-bikes. Wouldn’t you bike a lot more – say, to work for example – if it was a little bit easier? The Copenhagen Wheel is being marketed as a “new emblem for urban mobility”, an appropriate description since this innovative technology reflects the increasing global demand for sustainable urban mobility options. In my experience, a major drawback to choosing a bicycle as your primary means of transport – especially where commuting to work is concerned – is a bicycle’s unfortunate potential to dishevel one’s appearance. It’s uncomfortable to begin a work day sweating or winded, especially if your employer doesn’t provide changing facilities. Hopefully, the Copenhagen Wheel will mitigate this issue by not making you work as hard during your daily commute. Don’t worry though cyclists – you can control the level of help the wheel gives you, so when you want to exercise you can ride as hard as you want. Luckily for bike commuters, employee cycling incentive programs are on the rise in many cities, including bikeshare systems in more than 500 cities in 50 countries. In Asia, which has the largest number of shared bicycles, over 350,000 are available in China alone. In the midst of this rapid expansion and adoption of sustainable transport solutions, these numbers will certainly increase, but the Copenhagen Wheel could be a key influencing factor in determining the level of that escalation. Its design, a project of the Massachusetts Institute of Technology’s (MIT) SENSEable City Lab, focuses on pedal power – as you ride, sensors in the pedals coordinated with a smartphone app will measure your effort and give you a boost when you need it. That means riding uphill will take exactly the same effort as riding on flat terrain, which could be a major incentive for more people to choose bicycling on a day to day basis. Superpedestrian’s hybrid e-bikes will also act as mobile sensing units. The wheel’s sensing unit will collect a wide array of information about a rider’s surroundings, including road conditions, the levels of harmful pollutants in the atmosphere, and noise pollution. That information will be accessible through your smartphone or on the internet, along with a real-time map of pollution levels and traffic congestion. Each rider can choose to share their data with friends, or anonymously with their entire city’s network of Copenhagen Wheel users. As more and more cyclists share the data collected by their wheel, their city will gain a larger scale of aggregated environmental information. The battery-powered motor of the Copenhagen Wheel will be very efficient, as it will store energy in the wheel while a rider brakes and cycles. Thus, this new project offers a good choice for you in terms of an easier bicycling experience, and a smart choice for your urban environment. It’s an innovative way to encourage more people to join the ranks of urban cyclists, and a nod to the increasing demand by urban residents for sustainable transport options. Thank you to Matt Kroneberger, former blogger for TheCityFix, for inspiring this post!